Its sometimes hard to judge between two potential investments. Well, one way to do it is to use the rule of 72. 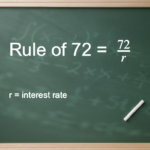 The rule of 72 says that if you divide any number that represents your investment return into 72 then the result will be the amount of time it takes for your principle to double. For example if you have an investment paying 5%, compounded, then your money will double in 14.4 years. The math is something like this: 72/5 = 14.4 years. This is a nice simple way to evaluate the attractiveness of two different investments. Lets say that you have the choice of putting $10,000 into either a bond fund or a stock fund. Assume the stock fund will return 7% and the bond fund will return 6%. That’s only a 1% difference. But lets factor in the time to takes for your investment to double using the rule of 72. Investment #1: stock fund at 7%. Investment #2: bond fund at 6%. So, the stock investment will double 1.7 years before the bond investment! That’s quite a difference. The bottom line here is if you are interested in optimizing your finances use the rule of 72 to compare your investment options. Awesome, I hadn’t ever heard of this but I love what it can help you estimate. Where did you first encounter this rule? My favorite rule, is the rule of 115. By dividing 115 by your rate or interest/return, you get to see how long it would take for the principle amount to triple. Thanks for stopping by and thanks for leaving a comment. The rule of 72 is a well known method of approximating the value of an investment. Its cool because as mental model, its very easy to work out and even easier to remember. I think what both rules boil down to a nice quick mental rules for evaluating your investments. I hope we can explore more of these in this blog. Thanks for stopping by!